As any new shooter soon discovers, shooting a handgun accurately isn't nearly as easy as they make it look on TV. Attaining proficiency requires a thorough understanding of the fundamentals of marksmanship coupled with a strong desire to improve. One of the best ways to better your skills is to analyze your targets routinely and listen to what they're telling you. Of the seven fundamentals of marksmanship, sight alignment, sight picture and trigger control are most critical to handgun accuracy. Sight alignment is the relationship between the handgun's front and rear sight. Sight picture is simply a matter of superimposing the aligned sights onto the intended target. Trigger control refers to the depression of the trigger to the rear until the shot breaks. To align your handgun's sights properly, you must confirm that the top of the front sight is level with the top of the rear sight. This ensures proper elevation, meaning that your aim is neither too high nor too low. Of course, you must also align the sights horizontally. How do you know if you're dealing with sight alignment issues? If, say, your groups at the five-yard line are pretty much on the money, but at 20 yards they're printing considerably farther left, you may need to work on alignment. However, also have someone else shoot the gun to rule out the possibility of the sights themselves being misaligned. If your zero is off, that too will really start to show up at longer distances. Rather than merely glimpsing this proper sight alignment, force yourself to stare at it for approximately 30 seconds. This will help imbed the image of proper sight alignment into your mind so that it's more recognizable for you when you're on the range or, more importantly, during a personal-defense situation. If your rounds are scattered, the problem could be that you're focusing more on the target than the front sight. As you can imagine, this is a serious concern when facing an armed assailant in the real world. By default, if you're focused on the threat, you're not focused on the front sight of your handgun. It wasn't until I had carried a handgun on duty for several years that I truly understood what it meant to obtain that elusive crystal clear image of the front sight. One day at the range, something finally "clicked" and the front sight became more pronounced than ever before. Prior to this revelation, I had merely looked at the front sight when shooting, but I hadn't focused on it as intently as was necessary to obtain maximum accuracy from my handgun. A clever drill that I picked up from National Training Concepts owner R.K. Miller is to have the shooter hold a pen and extend his arm out front. The shooter can pick a target in the distance and practice transferring his or her gaze from the tip of the pen to the target and back again. This trains the shooter's eye to transition between the front sight and the target. It's important to remind the shooter that when the shot breaks the focus should be on the tip of the front sight or, in this case, the tip of the pen. The act of manipulating the trigger has many names. Since the index finger contracts during this process, many naturally refer to trigger manipulation as "trigger pull." However, some instructors prefer the term "trigger press" because it denotes a more precise movement. Still others use "trigger squeeze" to describe trigger manipulation because they feel the word squeeze accurately conveys the gradual pressure that should be applied to the trigger when firing. No matter what you call it, trigger control is hugely important. Most instructors agree it's critical that the rearward movement of your index finger be smooth and steady as it moves straight back to fire the pistol. 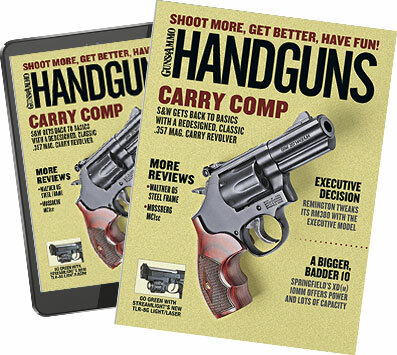 Two of the most common trigger control problems are to anticipate the gun's recoil—jerking the trigger—and failing to move the trigger finger independently of the rest of the hand. Anticipating recoil tends to result in a right-handed shooter's rounds impacting low on the target. This phenomenon is readily apparent when you engage in dry-fire practice using a pistol equipped with a laser. If, as a right-handed shooter, you jerk the trigger, the laser will slice downward and likely to the left, showing you where your live rounds would have impacted. Failing to move the trigger finger independently is less predictable because the point of impact is dependent on the movement of the shooter's hand when the trigger is activated. For instance if a right-handed shooter rotates his thumb clockwise during the trigger press, his rounds are likely to impact to the right. This error is often referred to as "thumbing." If your trigger manipulation isn't spot-on, all the sight alignment in the world can't save you. Shown are some common trigger errors and where they might be sending your bullets. Too much finger on the trigger is likely to result in "snatching" the trigger, which will send a right-handed shooter's rounds to the right of his or her point of aim. This occurs because the distal joint bending reflexively causes the hand and muzzle to rotate clockwise. Too little finger on the trigger is known as "pushing" the trigger because it causes the trigger finger to push the trigger back and to the left as opposed to straight back, resulting in rounds impacting near the nine o'clock position. Another error associated with trigger control is "heeling," in which the shooter exerts excessive forward pressure with the heel of the hand as the weapon is fired. This will likely result in a shot group near the 12 o'clock position. While the focus of this article has been on one-shot accuracy, it's important to consider that trigger control also deals with "resetting" the trigger from shot to shot. Resetting the trigger refers to the technique of releasing the trigger only as far as necessary for the handgun to be fired again. With most pistols there is both an audible "click" and a very slight forward thrust of the trigger against your finger as it resets. How can you tell if your trigger reset skills are lacking? Aside from being able to feel that you're not controlling the trigger, your groups will tend to widen. But there's no way to predict where your rounds will impact because it depends on the manner in which the gun moves as you press the trigger. Another simple and effective drill to facilitate trigger control is called the "penny drill." Place a penny on the front sight of your unloaded handgun, then obtain proper sight alignment and sight picture. Apply steady rearward pressure to the trigger until the simulated shot breaks. If the penny is still atop your front sight, you're as good as gold—or at least copper.